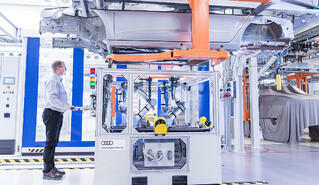 The history of robotics has always been closely tied to the automotive industry. In fact, in 1962 General Motors was the first-ever company to deploy industrial robots. And from the 1970s onwards, the whole automotive industry was characterized by the comprehensive use of large robot systems in their production lines. Up until now. Today, there’s a lot of change going on in automotive; Customers increasingly demand their cars to be customized and thus, batch sizes in production are becoming smaller and smaller. For car manufacturers and all their suppliers, this development means they always have to be prepared for changes in their production layout in order to address the new changes in customer demand. Therefore, next to precision and efficiency, flexibility has also become a key factor in the industry. Flexibility, however, is not considered a core competency of traditional industrial robots that stay bolted down in a cage, dedicated to one task only. This is why many manufacturers are now using collaborative robots in their production. One of them is Audi: At their ‘Tech Day Smart Factory’ event that took place at the company’s headquarter in Ingolstadt, Germany, Audi presented a new production concept which goes way beyond the traditional assembly line; this new concept embraces a modular and mobile approach of assembly in order to face the high complexity of new product varieties and continuous integration of new processes into production. Besides automatic guided vehicles (AGVs), flexible lightweight robots from Universal Robots also play an important role in their vision of the future’s factory. Nissan Motor Company could be considered a similar case, where staff members had to face the challenges of an aging workforce, associated with a loss of vital skills. One issue causing problems for the Yokohama plant were overrun cycle times, which resulted in the necessity of deploying relief workers, which in turn meant a greater labor and personnel cost for Nissan. Thus, by installing two lines of UR10 robot arms, Nissan solved two problems: the company’s cycle time overrun problem is a thing of the past now whilethe amount of heavy lifting has been significantly reduced for the staff. 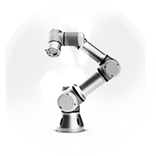 Not only manufacturers, but also their suppliers count on cobots. Just as an example, one of the world’s largest OEM parts suppliers, Continental Automotive, has installed six cobots automating the handling of PCB boards in the production of car instrument panels with three additional UR10 projects underway. Large multinational companies are not the only examples from the industry that cobotized their production, cobots are also finding their way into production lines at smaller companies such as as assembly applications at SHAD or blow molding at Linaset. And many more to come.